Operating out of the famous Mare Island Naval Shipyard, developers Factory OS in Vallejo, CA, are using leading software solutions like MWF to build entirely tech-ready multifamily homes more efficiently and at a lower cost within the offsite environment. 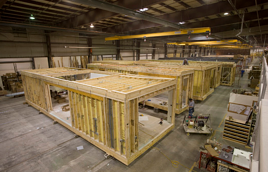 As technologies or methods vary, offsite construction generally involves a controlled environment for the process of planning, designing, fabricating, transporting and assembling building components for fast and more efficient onsite assembly rather than in traditional piecemeal on-site construction. Allowing for a much more precise workflow, this solution has a much smaller margin of error or risk. Developers such as Factory OS are now able to control project schedules and budgets while increasing quality, assuring the safety of laborers and reducing environmental impact by removing elements such as weather delays and site disturbance. With a greater degree of predictability it is clear that offsite manufacturing is the future of construction and one of the most viable solutions to solving the current housing crisis. To learn more about MWF, our CNC Modules and more, click here.